Stuxnet Hit 5 Gateway Targets on Its Way to Iranian Plant ! Attackers behind the Stuxnet computer worm focused on targeting five organizations in Iran that they believed would get them to their final target in that country, according to a new report from security researchers. The five organizations, believed to be the first that were infected with the worm, were targeted in five separate attacks over a number of months in 2009 and 2010, before Stuxnet was discovered in June 2010 and publicly exposed. Stuxnet spread from these organizations into other organizations on its way to its final target, which is believed to have been a nuclear enrichment facility or facilities in Iran. The new information comes in an updated report from researchers at Symantec , a computer security firm that has provided some of the leading analysis of the worm since it was discovered. According to the report, Stuxnet’s first attack against the five organizations occurred in June 2009, followed by a second attack in July 2009. Eight months passed before subsequent attacks were launched in March, April and May 2010. The last attack was just one month before the code was discovered in June 2010 by VirusBlokAda, a security firm in Belarus, which said it had found the malware on computers of unspecified clients in Iran. Symantec didn’t identify the names of the five organizations that were targeted; the company said only that all five “have a presence in Iran” and are involved in industrial processes. One of the organizations (what Symantec refers to as Domain B) was targeted with the worm in three of the five attacks. Of the remaining organizations, three of them were hit once, and the last organization was targeted twice. Symantec has so far been able to count a constellation of 12,000 infections in the five organizations and outside organizations to which the malware spread. The most successful attack occurred in March 2010 when 69 percent of these infections occurred. The March attack targeted only Domain B, then spread. Domain A was targeted twice (Jun 2009 and Apr 2010). The same computer appears to have been infected each time. 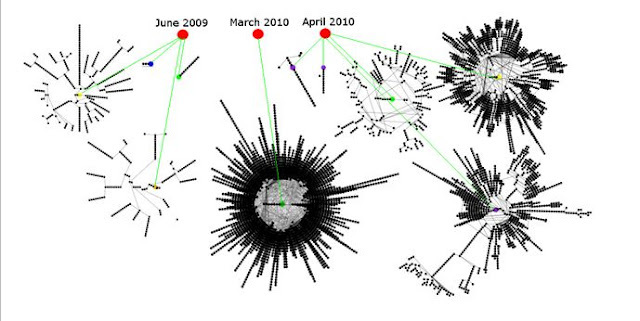 Domain B was targeted three times (Jun 2009, Mar 2010, and May 2010). Domain C was targeted once (Jul 2009). Domain D was targeted once (Jul 2009). O Murchu acknowledges that there could have been earlier attacks that occurred before June 2009, but no one has found evidence of this yet. Symantec found that the shortest time between when the malware was compiled in one case — that is turned from source code into a working piece of software — and the subsequent attack using the code occurred, was just 12 hours. This occurred in the June 2009 attack. Stuxnet was not designed to spread via the internet but via an infected USB stick or some other targeted method within a local network. So the short timeframe between compilation and the launch of the June 2009 attack also suggests that the attackers had immediate access to the computer they attacked — either working with an insider or using an unwitting insider to introduce the infection. Symantec, working with other security firms, has so far been able to collect and examine 3,280 unique samples of the code. Stuxnet has infected more than 100,000 computers in Iran, Europe and the United States, but it’s designed to only deliver its malicious payload when it finds itself on the final system or systems it’s targeting. On systems that are not targeted, the worm just sits and finds ways to spread to other computers in search of its target. To date, three variants of Stuxnet have been found (dating to June 2009, March 2010 and April 2010). Symantec believes a fourth variant likely exists, but researchers have not found it yet. One of the organizations, Domain B, was targeted each time the attackers released a new version of Stuxnet. “So it looks like they felt that if they got in there, Stuxnet would spread to the [system] they actually wanted to attack,” O Murchu says. After the worm was discovered in June 2010, Symantec researchers worked on reverse-engineering the code to determine what it was designed to do. Two months later, the company stunned the security community when it revealed that Stuxnet was designed to attack Programmable Logic Controllers (PLCs), something that until then was considered a theoretical attack but had never been proven done. PLCs are components that work with SCADA systems (supervisory control and data acquisition systems) that control critical infrastructure systems and manufacturing facilities. Shortly after Symantec released this information last August, German researcher Ralph Langner disclosed that Stuxnet was not attacking just any PLC, it was targeted to sabotage a specific facility or facilities. Speculation focused on Iran’s nuclear enrichment plant at Natanz as the likely target. Iran has acknowledged that malicious software struck computers at Natanz and affected centrifuges at the plant, but has not provided any details beyond this.